Food! · Julia P · Memoir · Non-Fiction · Quick Read! 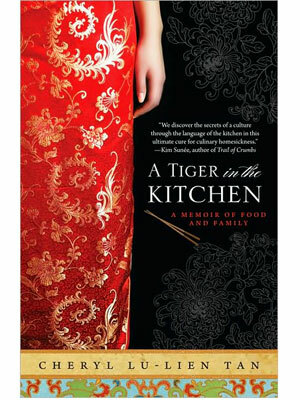 I hadn’t picked up a food memoir in a while so I thought it was time for some quality “food” reading 😉 A Tiger in the Kitchen is a memoir following Cheryl’s decision to reconnect to her Singaporean roots through the food she grew up eating with her family. She’s desperate to learn how to make the meals that are so deeply rooted in her own identity. A fortuitous break between jobs gives Cheryl the chance to travel back and forth between New York City and Singapore as she attempts to immerse herself in the various kitchens of her relatives. I really enjoyed reading about Cheryl’s culinary journey and it was very fulfilling to see her reconnecting with her roots and her family in a way she hadn’t been able to before. Reading this book will definitely make you hungry. Half the time I was reading all I could think about was what I wanted to eat when I finished a section… If you like reading about food/food memoirs I think you’ll enjoy this book.